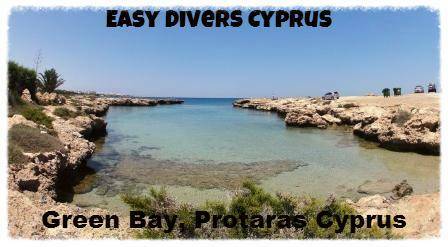 Green Bay in Protaras Cyprus, what a safe and easy dive site that Protaras has to offer. This dive site green bay offers suitable for all levels of scuba divers from discover snorkellers, PADI Discover Scuba Diving. Unforgetable Green Bay is a great training dive site for all levels of scuba divers. If you have a diver qualifications (certified scuba diver) and would like to make a dive refresher, this would be the perfect place to dive. This dive location Green Bay area is on the coast next ti a tiny fishing harbour. Picturesque Green Bay which features very easy walk-in shore entrance for divers to a calm sheltered bay offers depths of up to 1 – 3 meters and has been sanctioned by PADI as a confined water training area for padi courses. When you take your scuba excursions out into open water of green bay, you can expect to reach depths of up to a maximum 10 metres with lots of rocks, sculptures, sea grass landscapes ending in sand flats. You will love your first experiences in this calm bay for scuba. The famous ‘Fish Rock’ a feeding station with lots of beautiful colourful fishes, at a depth of just over 3 meters it is perfect for your First Underwater Scuba Experience, Padi Discover Scuba Dive. The dive site of Green Bay also offers the recently sunken statues, placed underwater at a depth of 8 metres for divers to enjoy. The underwater life plentiful and includes Tsipora (Sea Bream), Wrasse, Parrot fish, Cardinal Fish, Fire worms, Star fish, Cuttle Fish, and Pipe fish. The many crevices in the rocks make this dive site a perfect home for octopus. The marine life happily swim around you making Green Bay a dive site with endless sights to see. We can take many memorable pictures/photos and videos during your dives to make sure this dive is one for you to never forget.